The social media company apologized to Graham for their mistake. 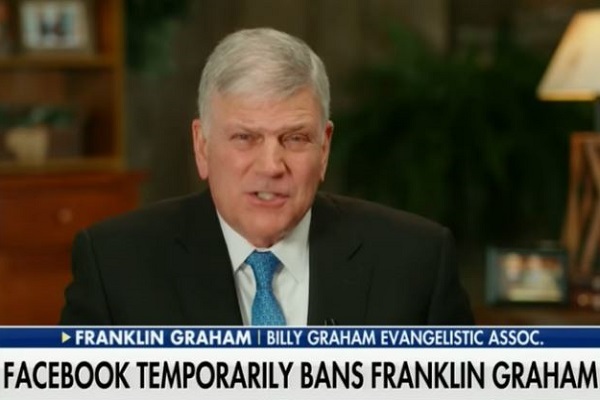 Evangelical preacher Franklin Graham has accused the social media giant Facebook of actively “censoring free speech” after his temporary 24-hour ban during the last week of December 2018. The block on his account happened as a reaction to a 2016 post concerning North Carolina’s HB2. The content of Graham’s post said that HB2 goes all the way to stop men from using women’s restrooms. The evangelical preacher also wrote that it was his belief the bill “protects the safety and privacy of women and children.” There is, however, no evidence that transgender individuals have attacked other users in any public facility. Facebook on its part admitted the company has made a mistake banning the preacher for an old post he shared in 2016. A Facebook spokesperson said Graham violated a company policy which bans “dehumanizing language.” Facebook policies crack down upon individual content which seeks to exclude people solely on factors like race and sexual orientation. The spokesperson added the content review team of the company made the mistake. The official revealed the team is 15,000 members strong and the social media company has restored not only Graham’s verified account but also the post at the center of the storm. Facebook said they will issue a formal apology to Graham’s page administrator. Even though his account was restored by Facebook, the preacher alleged on December 30 that it was his belief the temporary block was a kind of “personal attack.” During an interview with Fox & Friends, Graham said the social media site will classify any content as hate speech and consider the writer as a racist if the latter holds different views than Facebook does, particularly on the case of sexual orientation. Oh, for Pete's sake LET IT GO. Everyone gets banned for stupid stuff now & then. Do you think you deserve special treatment? Their apology was the same one I got for posting Burt Reynolds iconic Playgirl picture after he passed. So sick of christians claiming faux persecution. The 2016 North Carolina HB2 bill was ultimately signed into law in 2016. It was popularly named and known as the “bathroom bill.” Graham has since then accepted the apology tendered by Facebook and appreciated the quick manner in which the social media site solved the problem. Graham in recent years has helmed the Billy Graham Evangelistic Association and holds the presidentship of Samaritan’s Purse, the evangelism organization.